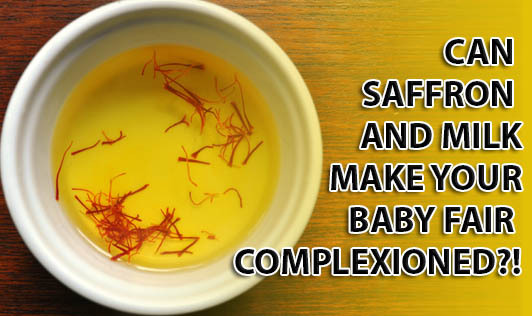 Can Saffron and Milk Make Your Baby Fair Complexioned?! This is a very common tip suggested for pregnant women across India by the old ladies in the family to get a "fair-complexioned baby". Many pregnant women do follow it religiously in order to give birth to a fair complexioned baby with pink lips and twinkling eyes! Do you think that it really works?? Let us put things into perspective. If this miracle drink worked irrespective of which part of the world you were born in, if you were drinking this magic potion, all of us would be fair-complexioned! But the fact is that there is no evidence to support that saffron consumption with milk leads to a fair-complexioned baby! The complexion of the baby purely depends on the maternal and paternal genes and not on any particular food. But it is true that following a healthy diet and lifestyle will definitely help you give birth to a healthy baby! On the other hand, saffron is an exotic herb known for its golden yellow color, taste and aroma. Let me share with you a few benefits of taking saffron in pregnancy. • Regulates blood pressure and reduces mood swings: Apart from purifying blood, saffron aids in controlling blood pressure and also helps to control mood swings in pregnant women. • Aids in digestion: Saffron cures most of the digestive problems in pregnant women like acidity, indigestion and regurgitation. It is one of the reasons why pregnant women are sometimes asked to include saffron with milk from their fifth month onwards when digestion problems in pregnant women are alleviated. • Boosts immunity and regulates body temperature: Moderate intake of saffron keeps body temperature in check ensuring warmth for the growing baby. Saffron is also known to boost immunity. A glass of milk with 1-2 saffron filaments daily from your fifth month of pregnancy is a good source of calcium and protein and also helps you in better digestion. As saffron has always been in high demand, you may end up buying adulterated saffron at the price of pure saffron. Always buy from a reliable source and check for its purity by immersing a filament of saffron in a small cup of luke warm water or luke warm milk. If the product expels color immediately, that means it is adulterated. But, if the color and the aroma are released slowly, it is a genuine product. However, pregnant women are advised to take it in the diluted form, making sure it is under the recommended amount, as excess can lead to uterine contractions. So, include saffron wisely and moderately in your diet. Ultimately, it is the baby's health that matters and not the complexion!